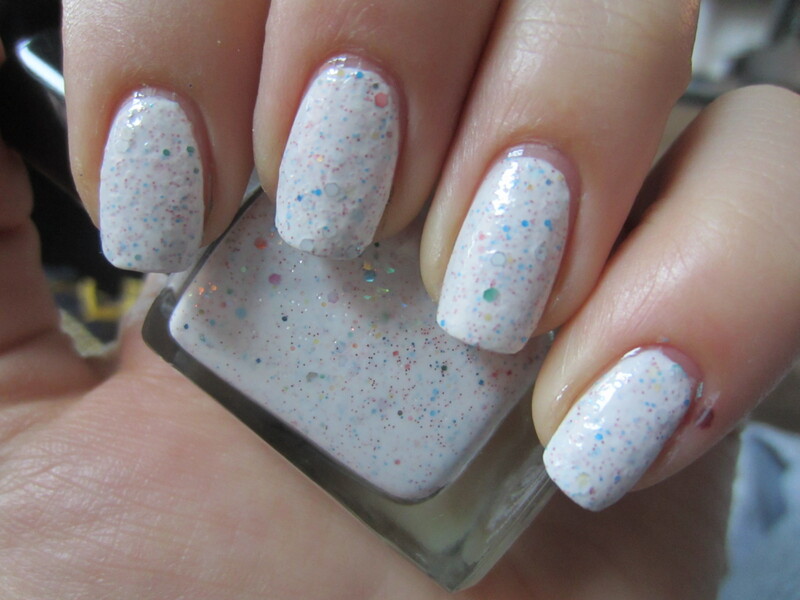 Here polish seriously looked like a jawbreaker candy and I thought to myself, “I can totally make that!” So I busted out a white polish and a ton of glitter and got to mixing. The result? I’m not totally thrilled with the texture of the polish but its a cool look! I love how the polish looks but wish it didn’t appear to rough and bumpy. Maybe if I play with it more I can make it turn out smoother but here’s a list of the polish I mixed to make this franken! Basically I took a clear coat bottle which had 1/4 left. Filled the bottle to 3/4 (roughly poured in 1/2 of the empty bottle) with the white. Then poured in equal parts of the 4 different glitters until the bottle was full. Shook it up and applied! Hopefully this was helpful! Have any of you guys tried Frankening polish??? If so, how did it turn out? ← Your Royal Shine-ness Gets Some Rainbow! That looks so cool! I’ll have to try it sometime when a few polishes get low.